ULMA Conveyor Components was founded in 1958 by a group of 17 workers that agreed on creating a company within a cooperative system, originally called Cooperativa Industrial de Ochandiano. The cooperative, under the name of ROCHMAN, S. Coop., was created by the first work communities established in the Otxandio region. It was officially registered with the Ministry of Labour, and little by little acquired full legal existence. It began its activities in December of 1958, providing general mechanical auxiliary and tool welding services. The primary motivation that led to this interest came from the existence of only one industrial company in the Otxandio region at that time, which was not able to respond to the local employment needs, which had been subject to a mindset change from a rural to an industrial one. To bring together the necessary financial resources for the onset of activity, they turned to a contribution of 50,000 pesetas from each associate, as well as refundable contributions of a minimum of 5,000 pesetas from village neighbours. Until 1965, the cooperative’s development was rather slow, and consisted of working as a subcontractor for a single client, FUNCOR, manufacturing agricultural machinery such as grinders, mixers and joints. As of 1965, a great surge took place. The product line was expanded with the addition of tool welding services and components for silos and agricultural facilities. Within these installations, the first conveyor belts for feed appeared. The first contact was made with the Spanish representative of the French company NACOMA, and between 1967 and 1968, a contract for technical support was signed, breaking into the fishing world by supplying installations for fish processing facilities. On another hand, a new initiative began, spurred by the existence of a product, the roller, associated to the feed conveyor belts that ROCHMAN manufactured for FUNCOR. At this point, they began manufacturing rollers, as well as all types of conveyors for foundries, quarries, paper mills, etc. During this period, the company became associated with Lagun-Aro on January 1, 1968, and with Caja Laboral on August 7, 1969. In 1984, it was decided to build a new production plant in order to house the manufacturing of rollers. The project of three autonomous units began to take form. In 1990, it was decided to begin exporting packing machines, which created the need to find an adequate sales brand. Once brand name recognition was achieved, and taking advantage of the change in statutes in 1995 from the new Basque Law for Cooperatives, the company changed the registered name of the Cooperative by combining it with the sales brand. In 1995, in light of the positive evolution of activities, the roller plant expansion began. In 1999, a new plant was inaugurated, to house the Maintenance Division. 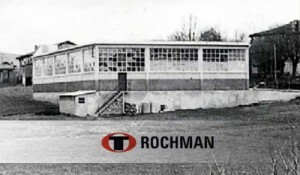 In May 2008, the ROCHMAN and ULMA C y E cooperatives approved the integration of ROCHMAN into the ULMA Group.